This is a continued series of Disney characters requested by a co-worker of mine. I have already made Mickey Mouse, Minnie Mouse, Woody, Dumbo, Bambi, Rabbit, Thumper, Jessie, Bullet, and Pooh. 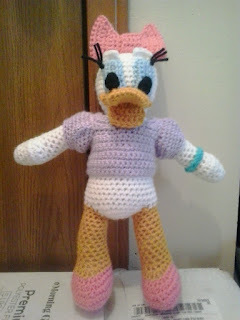 This is pattern that I have come up with for Daisy Duck. There will be more Disney characters coming soon. Worsted weight yarn: White, gold, blue, black, perfect pink, lavender, aqua and light blue. Rd 7: sc in next 10 sc, (sc2tog) 4 times, sc in next 10 sc. (24) Change to gold. Finish off leaving a long enough tail to sew HEEL to bottom of LEGS. Rd 3: 2 sc in next 4 sc, sc in next skipped sc on RIGHT LEG, working in sc behind same leg, sc in next sc, ch 1, sc in next sc, skip next 8 sc of same leg, sc in next sc, 2 sc in next 6 sc of BODY, sc in next unworked sc on LEFT LEG, working in sc behind same leg, sc in next sc, ch 1, sc in next sc, skip next 8 sc of same leg, sc in next sc. Rd 19: holding next sc on BODY and sc #4 on LEFT ARM together and working through both thicknesses, sc in next 3 sc, sc in next 5 sc of BODY, sc2tog, sc in next 4 sc, holding next sc on BODY and sc #10 on RIGHT ARM together and working through both thicknesses, sc in next 4 sc, sc in next 5 sc of BODY, sc2tog, sc in next 5 sc, holding LEFT ARM and BODY with right sides together, matching sc before marked sc on LEFT ARM and next sc on BODY and working through both thicknesses, sc in next sc, slip st in next 3 sc. IF DONE RIGHT YOU SHOULD END 3 SC AFTER BEGINNING SC. Rw 11: Ch 1, turn; sc in next 7 sc, slip st in next 5 sc, sc in next 5 sc, sc2tog, leaving remaining sc unworked. Rw 12: Ch 1, turn; sc2tog, sc in next 4 sc, ch 5, skip next 5 slip st (ARMHOLE MADE), dc in next 7 sc. Rw 11: With wrong side facing, attach lavender in first sc, ch 1, sc in next 6 sc, slip st in next 5 sc, sc in next 5 sc, sc2tog. Rw 12: Ch 1, turn; sc2tog, sc in next 4 sc, ch 5, skip next 5 slip st (ARMHOLE MADE), dc in next 6 sc. Finish off. Weave in ends. Repeat in second ARMHOLE. Place SHIRT on DAISY DUCK and sew back seam closed. Finish off leaving a long tail. Sew TAIL to BODY stuffing before closing. Rd 8: Slip st in next sc, ch 4, sc in second ch from hook, hdc in next 2 ch, sc in next 8 sc, ch 4, sc in second ch from hook, hdc in next 2 ch, slip st in next sc, ch 1, sc in same sc as slip st, sc in next 7 sc. Finish off. Sew BEAK to BODY. Finish off leaving a long tail. Wrap WRISTBAND around ARM and sew together. Weave in ends. Rd 1: With black, ch 4, sc in second ch from hook, sc in next ch, 2 sc in next ch working around ch, working in free loops of foundation ch, sc in next 2 ch. Finish off leaving a long tail. Sew PUPILS to EYES. Sew EYES to BODY. Finish off leaving a long tail. Sew EYEBROWS to BODY above EYES. Finish off leaving a long tail to sew Rw 1 to Rw 32. Finish off leaving a long tail to sew Rw 1 to Rw 9 after wrapping the piece around center of BOW and then BOW to head between EARS. Daisy Duck, Donald Duck, Mickey Mouse, Minnie Mouse, Woody, Dumbo, Bambi, Rabbit, Thumper, Jessie, Bullet, and Pooh is copyright Walt Disney Co. and their respective creators.